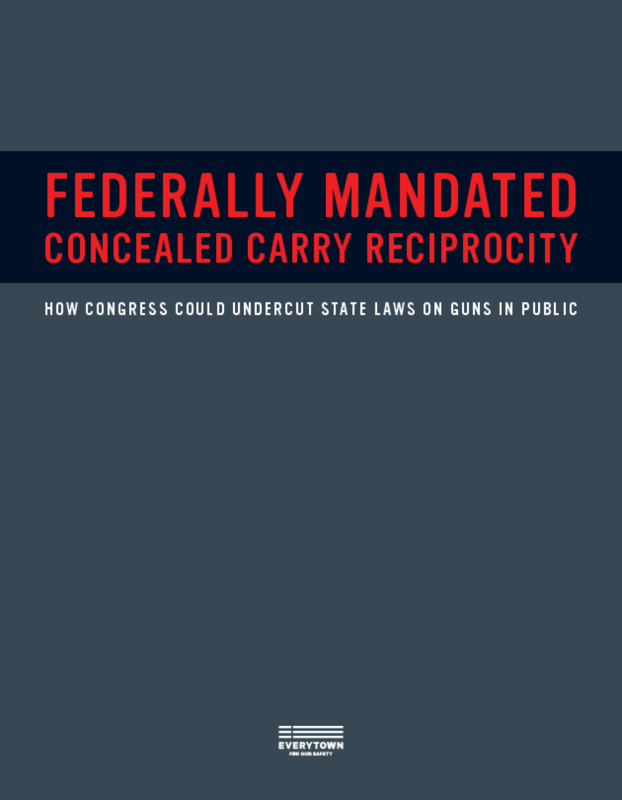 This report discusses states rights vs. federally mandated concealed carry reciprocity in determing permit laws for people who carry hidden or concealed guns. Determining who is too dangerous to carry a hidden, loaded gun in public is among the most important judgments that a state government can make, and exercising that police power is among the most basic of states' rights. Under current law, each state makes its own determinations about who can carry a concealed, loaded weapon in public, including deciding which other states' permits to recognize. But dangerous legislation introduced in Congress would interfere with states' rights and let the federal government dictate to each and every state who can carry hidden, loaded guns within its borders. Under this proposed "concealed carry reciprocity" legislation, the federal government would force every state to recognize concealed carry permits issued by every other state -- no matter how lax or ineffective a given state's permitting standards. Federally mandated concealed carry reciprocity would upend each state's carefully considered judgments about public safety. Under this scheme, even if a state has determined that public safety requires live-fire training for permit holders, the state would have to allow permit-holders from other states without any training requirement to carry guns on their streets. States that determined teenagers too young to buy alcohol or criminals convicted of assault or stalking should not be granted concealed carry permits would have to allow such people with out-of-state permits to carry hidden, loaded guns within their borders. Federally mandated concealed carry reciprocity would be a severe encroachment on states' rights. It offends the basic traditions of federalism on which the country was founded. Copyright 2016 Everytown For Gun Safety.